On this day last year a very long wander took me from my side of town and right round the houses over to the other side of town, via the Foss Islands cycle track, to St Nick’s Fields, where this lovely wonder was in bloom under a small clump of trees. It’s a remarkable place, St Nick’s. I was late in discovering it, and don’t visit it as often as my more local green spaces over on the Clifton side of town, but it’s always a joy when I do wander or cycle through, and I’m amazed at what has been made here, on what was an old rubbish tip. On the way back I took the photo of the Poor Clares sign included on yesterday’s page. That place is now undergoing major change, with some inevitable destruction and disruption, including in its gardens and the wildlife those gardens supported. But if you’re up that side of town you could go and have a wander through St Nick’s, and see if the fritillaries are in bloom yet, a reminder that nature finds a way — often with a little thoughtful human help in providing the right conditions for growth and flourishing. 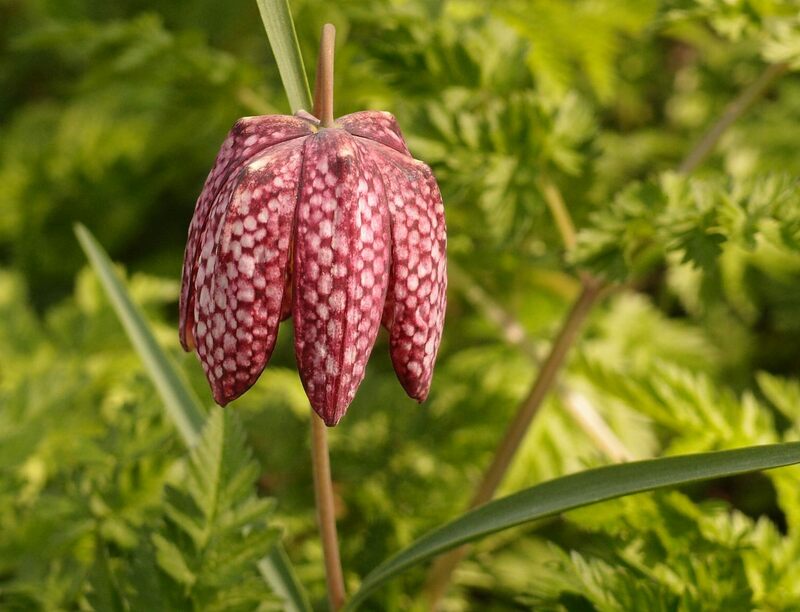 There’s a nice article about fritillaries in the Telegraph, from April 2014, and a mention of them in a recent blog posting on the website of St Nick’s. Have a read and have a visit — it’s a wonderful time of year to be out in green places, particularly if you encounter a fritillary in bloom. They speak of opalescent spring mornings, with their distinctive chequered bells bowed earthward and beaded with dew, a dark counterpoint to the acid-fresh grass. There were many photos I could have included for today’s ‘April daily photo‘, but a flower seemed most appropriate. Today, 10 April, would have been my sister’s 57th birthday, and I can’t forget that, even though it’s fifteen years since she died. So this page is in memory of Kay, and it urges you all to get out and enjoy the beautiful world, and make the most of it.